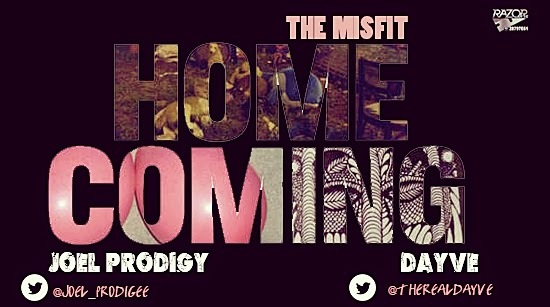 Joel Prodigee(@Joel_prodigee) and Dayve (@therealdayve) both rappers of the Christian hip-hop group THE MISFIT CLAN teamed up to create another song titled “HOMECOMING”. The song is intellectual and contains quality message that is straight from the heart where the rappers preach repentance. Joel Prodigee went in on the first verse while Dayve went in afterwards. Dayve(@therealdayve) is a budding Christian rapper from Delta state but resides in Lagos. Still an Undergraduate, he has been able to balance academics and music, which he calls his ministry. Dayve is an independent artiste who started Christian rap in 2012, the year he released “Just like you” ft. Rapsodee. Joel Prodigee (@joel_prodigee) , a Christian rapper who happens to be Dayve’s younger brother also shares a similar zeal. Known for Complex rhyme schemes, Joel also an Undergraduate takes Christian rap as a Ministry and holds it dear to his heart. Both rappers belong to a Christian Hip-hop group, THE MISFIT CLAN which also has artistes like Theesciple7 and Nissi Ibeh (a vocalist) in the group.